Guten tag! September 20 marks the beginning of Oktoberfest, the world’s largest beer festival, held in Munich, Germany. In honor of this annual celebration, we’ve paired German and German-style beers with works of art in the DMA’s collection. The Reinheitsgebot, or German Beer Purity Law, originated in 1487 and decreed that water, barley, and hops were the only permissible ingredients in German beer. Realizing that this was somewhat limiting, the 1993 Provisional German Beer Law expanded to allow additional components such as yeast, wheat malt, and cane sugar. The pairings below follow the more generous spirit of the later beer law. Let’s start with Weihenstephaner Original Premium. The Weihenstephan Monastery Brewery, in the Bavarian town of Freising, originated in 1040 as the monastery brewery of Benedictine monks and is the oldest existing brewery in the world. Weihenstephaner Original Premium is a classic German lager, with clean, crisp flavors with a touch of sweetness, like a doughy bread. 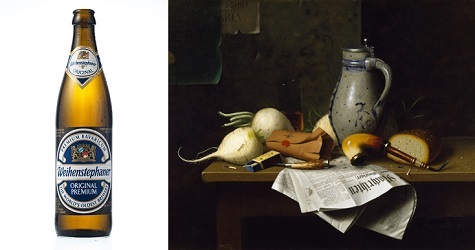 This beer pairs well with Munich Still Life by William Michael Harnett. Harnett, an American artist born in 1848, studied in Munich from 1881 to 1885. This painting from 1882 shows a collection of everyday objects from his Germany experience (note the beer stein and doughy bread). Another product of Weihenstephaner is the Kristall-Weissbier. The Weissbier, or “white beer,” is one of five different types of wheat beers. The Kristall-Weissbier is named so because it is a filtered wheat beer, resulting in a crystal-clear quality (kristall is German for “crystal”). We couldn’t talk about a wheat beer without mentioning Vincent van Gogh’s Sheaves of Wheat, of course. In a letter to painter friend Emile Bernard, van Gogh wrote, “I even work in the wheat fields, in the full midday sun, without any protection . . . I bask in it like the crickets.” Visualize, if you will, van Gogh painting in the middle of this sunny wheat field, surrounded by the yellow color of wheat that we see both in his painting and in the Kristall-Weissbier. For a different type of wheat beer, try the Urweisse from Ayinger Brewery in Aying, Bavaria. The Urweisse is an example of the Dunkelweizen type of wheat beer; it is unfiltered, and a darker malt is used, which creates an amber color. Mellow in flavor, this beer has a banana scent and a mild fruity flavor. Since it is unfiltered, the yeast settles to the bottom; swirl the bottle around just before you pour it to circulate the yeast and flavor throughout each sip. 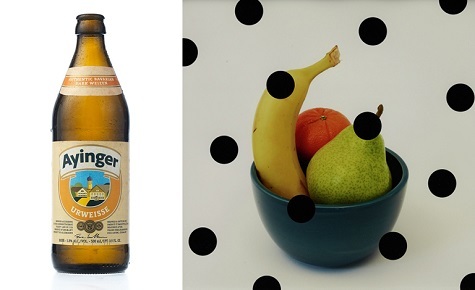 Margaret Lee’s 2013 photograph titled Dots on Top comes to mind, with its fruit centerpiece and floating polka dots. Although it looks like a centerpiece of actual fruit, the artist created the banana, orange, and pear by hand, using plaster, which aptly complements the slightly artificial (in my opinion) banana scent from the Urweisse. The Aventinus Eisbock by Schneider Weisse brewery in Kelheim, Bavaria, also boasts a unique story. Traditionally, beer barrels were loaded up on carriages overnight for delivery. Legend has it that a barrel fell off a wagon during cold weather and broke, revealing a block of ice. Since alcohol does not freeze, a concentrated version of the beer remained liquid in the center, surrounded by frozen water. The stronger, undiluted beer has a sweet plum, banana, and clove flavor. Another item with a luxurious treat in the center is this ice bowl (with spoon), produced by the Gorham Manufacturing Company in the early 1870s. The ice within the bowl was admired as much as the beautiful silver container, since it had to be imported before the age of refrigeration. Gasthaus & Gosebrauerei Bayerischer Bahnhof brewery in Leipzig, Germany, is known as the home of the Gose. The Gose is a dormant style of beer; first brewed in the 16th century, it disappeared several times before resurfacing again in the 1980s. The Gose originated in the north German town of Goslar. Just a few hours from the Baltic Sea, the salt and mineral quality of the water lends a saltiness to the flavor of the beer. 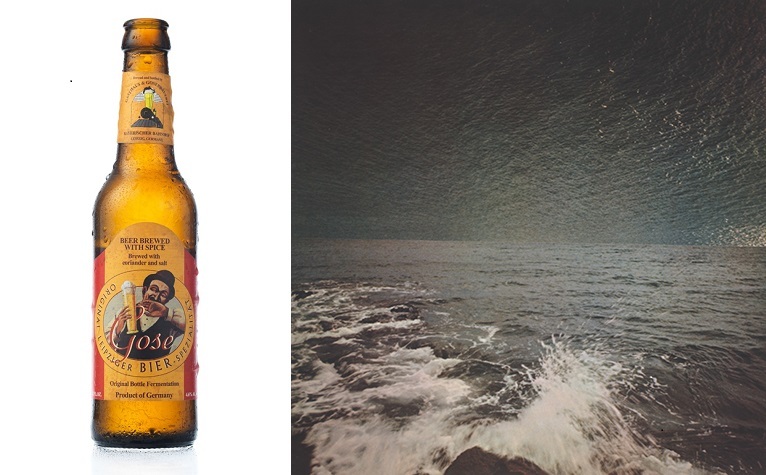 Sipping a Gose transports you immediately to a beach with salt in the water and whipped into the air by frothy waves, as seen in Sea by German artist Gerhard Richter. Many American breweries produce German-style beers as well. Hans Pils, brewed by Real Ale Brewing Company in Blanco, Texas, is inspired by pilsner beers of northern Germany. Much like German pilsners, the Hans Pils is a drier, crisp beer. The Hans Pils takes an American interpretation by incorporating a hop finish in the flavor. 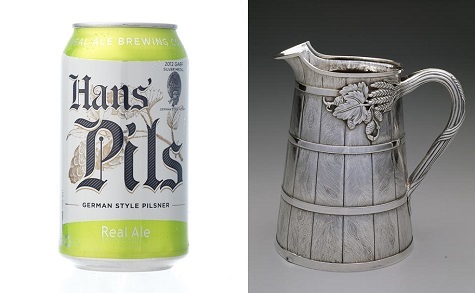 Hops are also integral to the design of this silver beer pitcher by Bailey and Company, creating a decorative detail for the elegant handle made of grain. Last, but not least, is Pearl Snap by Austin Beerworks in Austin, Texas. Crisp and clean, the Pearl Snap is also a German-style pils (or pilsner). It is less hoppy, not as dry, and slightly more malty in flavor than the Hans Pils. 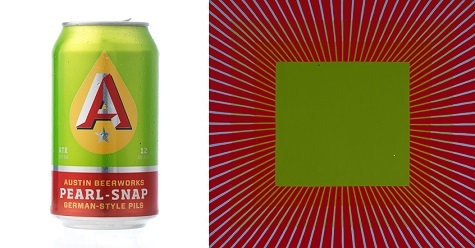 The bright green and red can with its geometric design elements brings to mind Richard Anuskiewicz’s Untitled painting, date unknown (Anuskiewicz was born in 1930; his career spans the 1950s through the present). Special thanks to The Meddlesome Moth and Matt Quenette, Certified Cicerone (i.e., beer guru) and Beer Director at The Meddlesome Moth. This blog post would not have been possible without Matt’s assistance and encyclopedic knowledge of beer. If you are intrigued by any of these beers, most of them can be purchased by the bottle at The Meddlesome Moth. 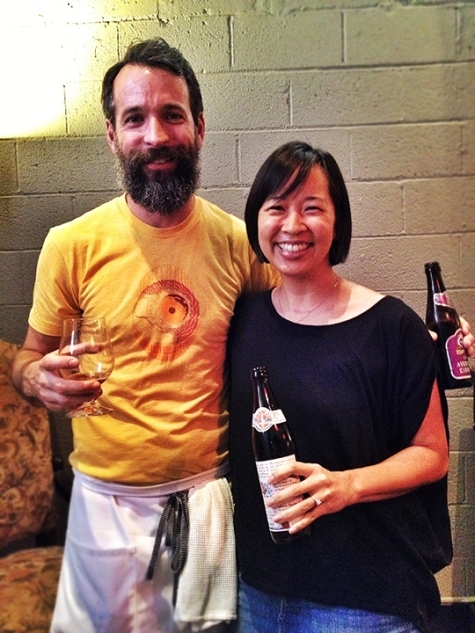 Thanks also to Cyndi Long, who provided these beautiful images of the different beers. Melissa Gonzales is the C3 Gallery Manager at the DMA. Although she enjoys drinking and learning about beer, she is no way an expert; however, she IS the 2nd annual DMA Texas Beer Tasting Competition Champion. 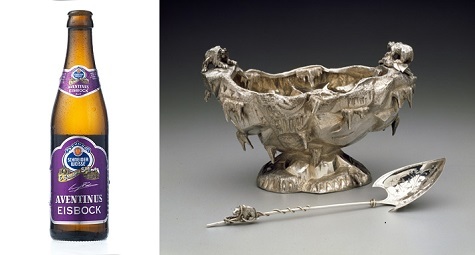 Ice bowl (with spoon), Gorham Manufacturing Company, c. 1871, Dallas Museum of Art, The Eugene and Margaret McDermott Art Fund, Inc.
What a great post and a unique idea to link cultural and historical traditions in brewing with art. Fun way to make art seem more accessible too.